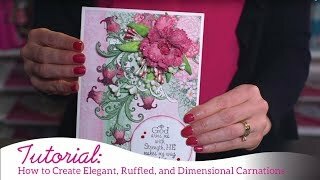 Add a touch of fanciful beauty to handmade cards, scrapbook layouts or altered art pieces with elegant and attractive carnation cluster embellishments! When paired with the coordinating cling stamp set, these beautifully detailed die cuts showcasing carnations in various stages of bloom are perfect to use as main focal points on projects, or as subtle backdrops for gracefully ruffled dimensional carnation flowers! These dies are part of the Camelia Carnation Collection and pair with the Fanciful Carnation Cling Stamp Set.